I am a songwriter and a songleader based in Minnesota. I write songs for groups to sing together. Songs on themes like neighborhood life, social justice, inclusion, nonviolence and fishing. You can find and download my songs here: I hope you can find a way to sing them, too. I also lead groups in singing: I’m interested in helping groups of ordinary folks sing together: community sings, progressive churches, big and small events, social change organizations, and concerts. Let me know if you’re interested in working together. More About Bret: Bret Hesla has worked as a songwriter and songleader since 1986. He writes songs and hymns for groups of ordinary folks to sing together, with lyrics that reflect a commitment to community, peace, care of the earth, social justice. 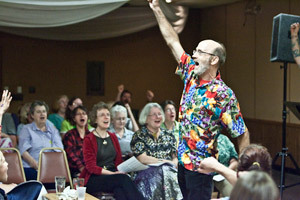 Bret leads singing for community sings, church groups, school groups, and social change movements. 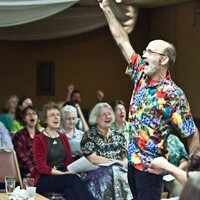 He also leads workshops on community singing, songwriting, and songleading. Bret ‘s newest venture is Minnesota Community Sings, where he is working with Twin Cities songleader Mary Preus to promote and revive the practice, from its heyday early in the last century, of friends and neighbors gathering in parks and public places to sing. Bret has worked for more than 15 years with St. Paul-based Advocating Change Together, using songleading and collective songwriting to build leadership and advance civil rights and self-advocacy for people with developmental and intellectual disabilities. He is also a founding member of the nationally acclaimed music group Bread for the Journey, a Minneapolis-based ensemble that since 1992 has traveled nationally to teach and lead songs of faith, hope, justice and inclusion from progressive Christian communities around the world. On the non-music front: once upon a time Bret got a BA and MS in biology. He and his wife Jaimie and two children co-founded a rural residential cooperative in the 90s, and built (with tons of help and direction from Todd Osman) a straw bale house in southeastern Minnesota. They all currently live in Minneapolis.